Photo challenge: take a moment to look up. 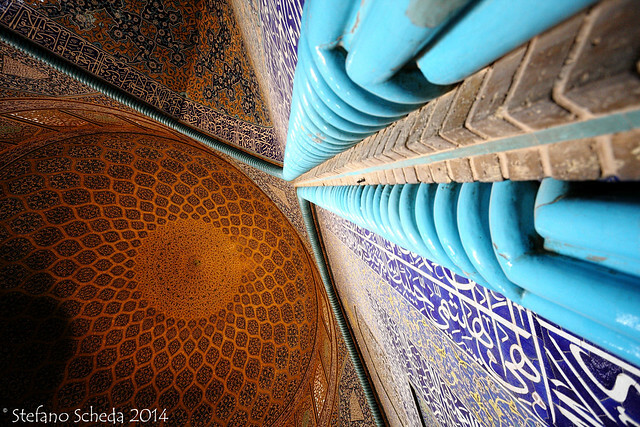 Sheikh Lotfollah Mosque – Isfahan, Iran. Che foto spettacolare. Immagino cosa sia viverla dal vivo. Grazie, Dom. Sì, quei mosaici sono incredibili. Absolutely beautiful shot! Thank you for sharing. Thank you, Manny, for stopping by and commenting. I love the colors and the perspective – perfect! Thank you so much, Lexie. What an amazing image, wow!! Have you been in Iran lately? It is on top of my travel list. I’ve been there two years ago. Fascinating and conflicting. A dramatic photo with lovely colour! Thank you very much, Regina.